The Mosque of the Prophet (Masjid al Nabawi) is the second holiest mosque, after the Masjid al-Haram in Mecca. It is the second mosque to be founded by the Prophet Muhammed (saws), the first was Masjid Al-Quba. It was originally built by the Prophet Muhammed (pbuh) and his companions and has later been extended several times by his followers. 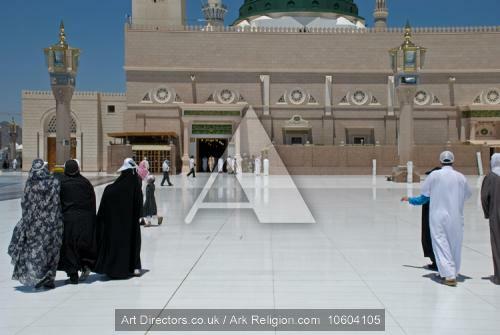 Madinah Saudi ArabiaThe Mosque of the Prophet (pbuh) became his resting place after his death. The last Prophet's (pbuh) resting place is beneath the green dome. The first caliph, hadrath Abu Bakr Siddiq (ra), and the second caliph, hadrath Umar ibn Al Khattab (ra) are both also resting here. It contains a fourth grave as well, which is reserved for hadrat Isa / Jesus (as), when his time is up after his return to the earth. The Prophet's (pbuh) lived where the dome is today after the Hijrah. The Rawdah - the area between his house and the original mihrab is a part of Jannah - paradise, according to a saying (hadith) of the Prophet (pbuh). He said: "What is between my house and my minbar is a garden from the gardens of Paradise". It is extremely crowded here - often hours before the prayer time, as it is every worshipper's desire to pray here. The area holds only a few hundered worshippers - maybe up to a thousand.The part of the mosque which currently surrounds the green dome has been expanded several times during different times. It therefore contains architecture of different styles. The other parts are of newer extensions, and they look quite similar.